Approximately 80 km north of the Arctic Circle, Old Crow is a Yukon village of about 240 indigenous people known as the Vuntut Gwitchin. Situated on the banks of the Porcupine River, Old Crow is accessible only by aircraft or canoe. 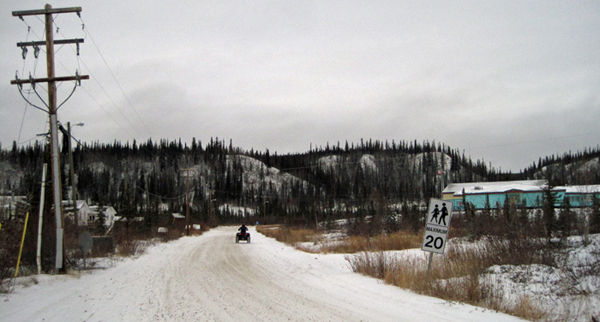 In 2014, for the first time in 10 years, a 260 kilometre winter road was built, running north from the Dempster Highway. For three weeks, semi-trucks filled with building supplies and household goods made eighteen to 20 trips. "Vuntut Gwitchin" means "People of the Lakes." This name derives from the annual muskrat trapping season from April to June, where families move approximately 27 miles north into Crow Flats (an area with many small and large lakes). The Vuntut Gwitchin livelihood is based in trapping, hunting, and fishing. To this day, the Porcupine Caribou provides the main source of meat as well as hide for boots, moccasins, mitts, traditional outfits, and other decorative things. Everything of the caribou is used by the Vuntut Gwitchin people and 150,000 to 180,000 caribou migrate through the traditional lands to cross the Porcupine River twice a year. The language of the Vuntut Gwitchin is "Gwich'in." The Gwich'in Nation expands across the north in Alaska in the USA and the Northwest Territories in Canada. Language and cultural practice preservation is important to those living in Old Crow.